More than 350 ladies attended one of the most glamorous events to hit the north-west of Ireland this year on Sunday, October 22, at Kilronan Castle Estate & Spa, in the form of the Spectacular Pink Ribbon Ladies Luncheon. They came from far and wide to support the event, with all proceeds going to The Irish Cancer Society and Action Breast Cancer. 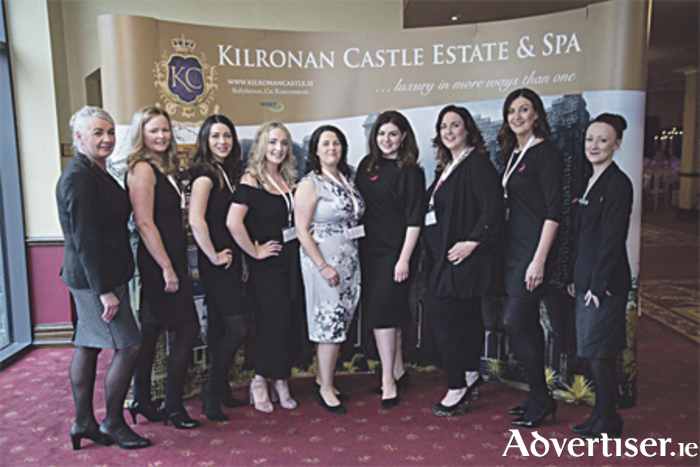 The event began with pink champagne and canapés for all the ladies in attendance and this was followed by a delicious four-course luncheon prepared by Kilronan Castle’s executive head chef, David Porter. Christina Regan from The Irish Cancer Society was a guest speaker at the event and made a very positive and uplifting speech before lunch began. Sile Seoige was an incredible host, entertaining the ladies with hair and beauty tips. After lunch, Mandy from Catwalk delivered an excellent fashion show with participants including Marian’s of Boyle, Olivia Danielle Athlone, Next Sligo, Claudia Tahney, Cora Byrne, and the incredible Catriona Hanly, all showcasing their new autumn/winter range. There were some amazing prizes raffled on the day, from an overnight stay at Lough Rynn Castle Estate & Gardens and Elemis gift sets worth more than €250. Grafters Hair Company donated a discount voucher for everyone in attendance. Sales and marketing manager at Kilronan Castle, Samantha Keeling said: “I am so proud of the team here at Kilronan Castle Estate & Spa. They all worked extremely hard to make the day the huge success it was. The attention to detail was second to none. With over 350 ladies in attendance, who may I say all looked truly beautiful on the day, we are absolutely delighted to confirm we raised over €8,200 - exceeding last year’s donation, for such a great cause as The Irish Cancer Society and, in particular, Action Breast Cancer. Page generated in 0.0949 seconds.